With all due respect to pumpkins, nothing says ‘fall’ in our book like apples. One for a favorite teacher, one a day to keep the doctor away, one that doesn’t fall far from the tree…the list goes on. 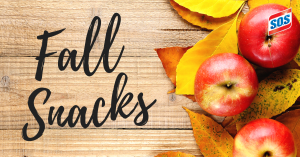 So if you’re like us and relish fall as a time for all things apple, here are some quick and easy apple snacks to kick off the season. Caramel Apple Nachos: Dice up Granny Smith apples and lay on a platter for “chips.” Coat with the toppings of your choice: melted caramel of course, but also experiment with drizzles of melted marshmallow or white chocolate, pieces of pretzel or candy bars, chocolate chips, peanut butter chips, coconut and more. Apple Pie Tortilla Roll-Ups: Grab a can of apple pie filling, some tortillas, cinnamon, sugar and butter for this simple-yet-delicious treat. First, combine your cinnamon and sugar in a shallow dish. Next, top your tortilla with a few spoonfuls of pie filling. Roll tightly, brush with melted butter and dredge through the cinnamon sugar mixture. Place seam-side-down into a greased baking dish (we’d suggest greasing with butter vs. cooking spray), and bake for about 15 minutes at 350 degrees, or until they start to brown. 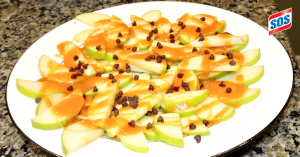 If you have any caramel left from your caramel apple nachos, that makes a great topping for these as well! If apples aren’t your thing, maybe you relish fall for the start of football season! From pee-wee flag football fields to professional stadiums, tailgating – and great tailgating snacks – are a football staple. Here are some fun and simple football-themed snacks to delight at any level. 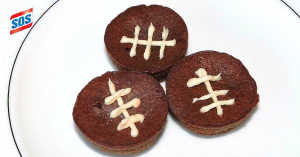 Football Brownie Bites: Grab your favorite brownie recipe and whip up a batch of brownie bites (or even easier, just pick them up at the store!). Then use white frosting or melted white chocolate to add ‘laces.’ Done! Football Cheeseball: Make your favorite cheeseball recipe and shape into a football using plastic wrap. Pick a topping to turn your cheeseball brown; bacon bits or pepperoni work well for a savory cheeseball, whereas chocolate chips or sprinkles work well for a sweet version. Create laces using white cheese slices or frosting, and voila! 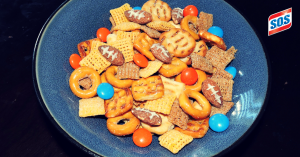 Embellish your Snack Mix: Grab a bag of your favorite snack mix and embellish with chocolate candies in your team’s colors. You can also draw frosting laces on almonds and add those tiny footballs to the mix. Fall is in the air! And we hope these quick, simple and festive snacks help you make the most of this autumn season. 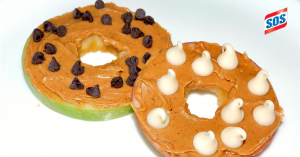 Have other apple or football-themed snack ideas to share? Let us know in the comments below or on the S.O.S Facebook page. And don’t forget to follow us on Facebook, Twitter, Pinterest and Instagram too!